Social Commerce is a buzzword and it’s hot lexical real estate, evoking a fusion of two big digital trends of “social media” and “e-commerce”. As a result, social commerce means different things to different people (see list below), and it’s been the target of a number definitional land-grabs by businesses seeking to define the term based on what they sell. Okay, so you can’t use the word cloud definition of social commerce as your elevator pitch definition, but exploring the cloud provides a conceptual understanding of social commerce and its key themes (don’t want to go all Wittgenstein on you, but idea clouds approximate to how our minds store concepts). The social commerce cloud is also a potentially useful creative stimulus in thinking about how to deploy social commerce. 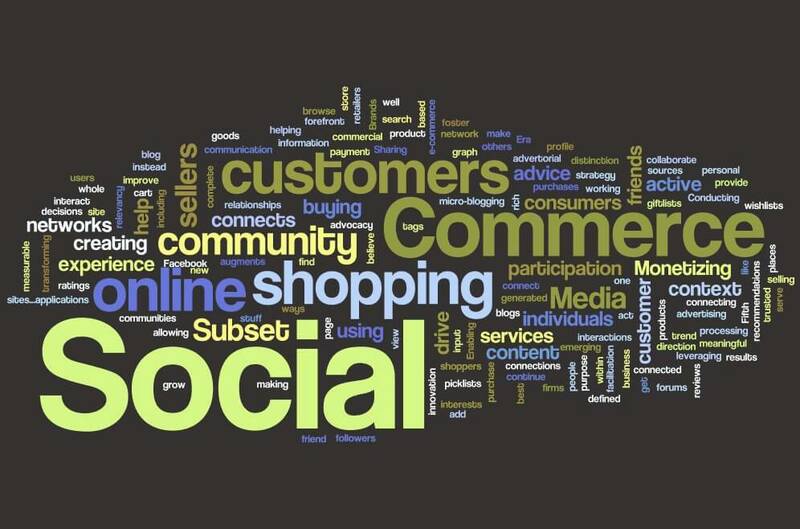 Based on the word cloud we’ve come up with a simple inclusive definition of social commerce. Social Commerce: A subset of electronic commerce that involves using social media, online media that supports social interaction and user contributions, to assist in the online buying and selling of products and services. [Update] As the above definition denotes, the concept of social commerce has been expanded beyond e-commerce to include the use of social technologies in the context of retail – whether online or in-store. Examples of social commerce include user ratings and reviews, user recommendations and referrals, social shopping (sharing the act of online shopping together), user forums and communities, social media optimization (for e-commerce), and social applications and social ads linked to e-commerce. And hey, if you don’t like this inclusive definition of social commerce, you can always pick one from the timeline list of definitions below! Social Commerce: Creating places where people can collaborate online, get advice from trusted individuals, find goods and services and then purchase them. Social Commerce: Customers having the means to interact with one another in order to make better buying decisions. Social Commerce: A trusted environment where friends, family, and acquaintances dynamically contribute content to the referral and sale of goods and services through positive and negative feedback, reviews, ratings and testimonials regarding their experiences past & present. In short, social commerce is a trusted environment in which prospective consumers make buying decisions based on the advice of a network of friends and family, not strangers they don’t know or trust. Social commerce: Subset of e-commerce in which the active participation of customers and their personal relationships are at the forefront. Social Commerce: Monetizing social media sites…applications transform[ing] a profile page on a social network into an online store, complete with payment processing. Social commerce: Emerging trend in which sellers are connected through online social networks, and where sellers are individuals instead of firms. [The distinction between social shopping and social commerce is that while social shopping connects customers, social commerce connects sellers]. Social Commerce: [The Fifth Era of Social Media]: Brands will serve community interests and grow based on community advocacy as users continue to drive innovation in this direction. Social commerce: Working with or using your social graph, which is defined as your followers or your friends, and allowing them to help you make buying decisions.